SAN DIEGO – The Council on American-Islamic Relations (CAIR) tried to have it both ways – claiming to be a civil rights organization when it suits its purposes, but admitting at other times that its mission is religious. That duplicity has cost CAIR a partnership with San Diego public schools and threatens to sabotage a plan to take an educational program national. 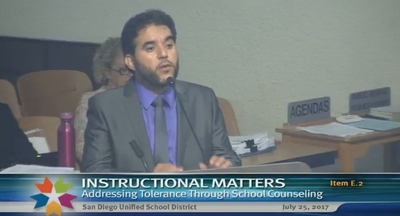 San Diego school board members agreed Tuesday night not to work with CAIR on a campaign to specifically fight anti-Muslim bullying generated by an exaggerated CAIR report. Instead, the Anti-Defamation League is poised to work on a program that aims "to comprehensively address the issue of bullying of all students." The agenda item specifically mentioned that school board "staff is redirected from forming a formal partnership with CAIR to forming an intercultural committee which shall include representatives of from all faiths and cultures and which shall provide input to District staff on issues of cultural sensitivities and the individual needs of various subgroups within our diverse community." Still, speaker after speaker criticized the proposal for excluding CAIR and for not specifically emphasizing anti-Muslim bigotry and "Islamophobia." CAIR-San Diego Executive Director Hanif Mohebi managed to make that argument while still denying CAIR was singularly focused. "We have never come out saying that it should only be one group. But I think also we should realize that it might be a mistake not to focus on groups that are targeted much more than the rest," Mohebi said. "So that being said, we expect the district to publicly acknowledge and recognize the work that we have done for over a decade with the school district." While the Anti-Defamation League also has a focus on protecting a specific group – Jews – Regional Director Tammy Gillies said its mission also is to "secure justice and fair treatment for all. That 'and' is the most important part of our mission statement. When one community is unsafe we are all unsafe." The ADL program, she noted, has been evaluated by Columbia University, the University of Pennsylvania, Yale and other respected institutions. The board agreed to work with CAIR in April. CAIR's program aimed to increase education about Islam in the classroom. Parents and religious liberty advocates balked at singling out Muslim students for safe places without providing similar accommodations to other faiths. Muslim holidays would have been added to the school calendar, and campus events falling on those holidays would be rescheduled. It was obvious, though, that board members reluctantly decided to implement a broader policy addressing bullying across cultures and religious backgrounds. Vice President Kevin Beiser reaffirmed his support for CAIR and thanked it for over a decade of partnership, but said supported the revised proposal "because I believe it codifies the board's commitment and my commitment to making sure that all students are safe. We do have certain groups of students who are bullied at much higher rates than other students. "We need to work together to solve that problem," Beiser said, "and we want to thank CAIR and all of you in the Muslim community for your partnership." The anti-bullying program was never about "promoting a religion" as some critics claimed, said Board President Richard Barerra. But lawyers with the Freedom of Conscience Defense Fund (FCDF) sued the school district in May, claiming the program did place Muslim students above others, violating the First Amendment's establishment clause, the Fourteenth Amendment and California law barring assistance to religion. They also claimed the anti-bullying program was a solution to an exaggerated problem. None of the speakers advocating for CAIR's continued involvement addressed that Constitutional concern. A report by CAIR's California chapters, "Growing in Faith: California Muslim Youth Experiences with Bullying, Harassment & Religious Accommodation in Schools" inspired the program, FCDF's lawsuit claims. The school district's decision to back away from partnering with CAIR is an important victory, FCDF Executive Director Daniel Piedra told the Investigative Project on Terrorism (IPT). But he remains concerned that CAIR still may partner with the school district on other programs. Mohebi and his allies seemed upset that they will not be able to use the school district to further their agenda, Piedra said after the meeting. "They talk about equality, but it's really Orwellian because in their philosophy and the school board's philosophy, they are really saying that all students are equal but that some students are more equal than others," Piedra said. The FCDF lawsuit remains alive despite Tuesday's decision to switch from CAIR's program to the ADL's. The group wants to learn more about CAIR's role in drafting the anti-bullying program. If it turns out that CAIR was intimately involved, the lawsuit may move forward because students' rights would have been violated, Piedra said, and to ensure that CAIR loses future opportunities to shape policy. FCDF could seek monetary damages, he said, but it may ask a judge to impose a consent decree compelling the school district to not partner with CAIR again. "We are willing to work with them; however, violating the Constitution is a serious allegation, and we are going to hold that to the school district every step of the way," Piedra said. Under the now-abandoned program, students accused of bullying Muslim students were supposed to face "restorative justice," requiring them to reconcile with the other student. The school district would provide monthly reports on the bullying of Muslim students and post them online. The district's reversal follows the FCDF's amended complaint filed last month, which challenged CAIR's local effort to hide behind the label of being a "civil rights organization." It pointed to testimony by CAIR co-founder and Executive Director Nihad Awad, who told the National Labor Relations Board (NLRB) that it lacked jurisdiction over a fight over unionizing CAIR employees because CAIR is a religious organization. Charles L. Posner, regional director of the National Labor Relations Board, wrote in an April 7 ruling that Awad claimed CAIR letterhead includes the invocation, "In the Name of God, the Compassionate, the Merciful," which opens every chapter in the Quran," because it's a religious organization. This religious acknowledgement goes to the heart of the Establishment Clause's separation of church and state. The loss of the San Diego program is a set-back for CAIR's desire to take an "anti-Muslim bullying" program national. It represents the biggest government rebuke to CAIR since the FBI instituted a policy in 2008 to break-off outreach programs due to CAIR's documented history in a Muslim-Brotherhood created Hamas-support network in the United States. And it should send a message to districts throughout the country, Piedra said, warning CAIR that his organization will sue any public school district that partners with it in a similar anti-bullying program. "We want to be sure for the benefit of our schoolchildren that CAIR is kept out of America's schools," Piedra said.